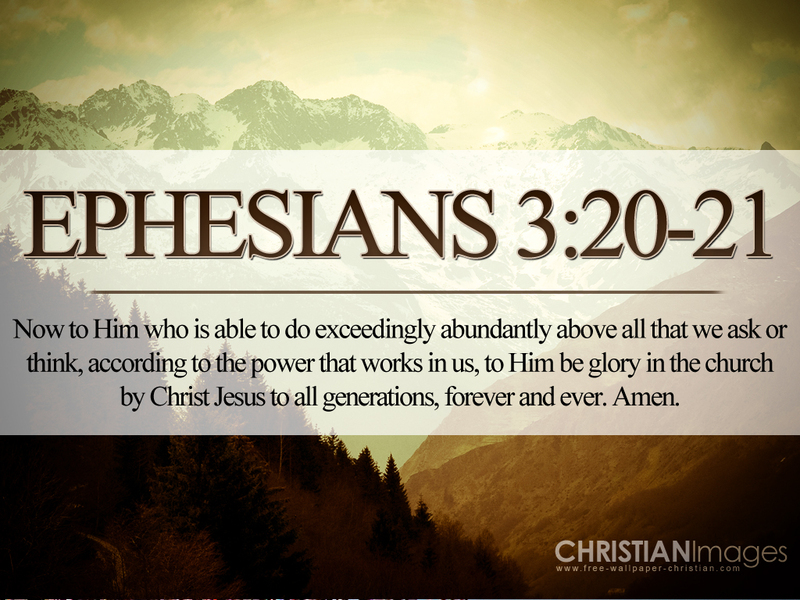 Now to Him who is able to [carry out His purpose and] do superabundantly more than all that we dare ask or think [infinitely beyond our greatest prayers, hopes, or dreams], according to His power that is at work within us, to Him be the glory in the church and in Christ Jesus throughout all generations forever and ever. Amen. To enlighten souls and open eyes of the blind. When Christ first spoke the truth to those with ears to hear. We walk in the spirit of love and have no fear. We have been empowered by the spirit of might. To serve the Lord, to please Him is our soul’s delight. We shall know fulfillment of all that God has planned. The riches of the glory of this mystery. God sealed us by a covenant, and it is so. Got any mountains you cannot tunnel through? And He will do what no other power (Holy Ghost power) can do. 25To the only wise God our Savior, be glory and majesty, dominion and power, now and ever. Amen. 14 When I think of all this, I fall to my knees and pray to the Father, 15 the Creator of everything in heaven and on earth. 16 I pray that from his glorious, unlimited resources he will empower you with inner strength through his Spirit. 17 Then Christ will make his home in your hearts as you trust in him. Your roots will grow down into God’s love and keep you strong. 18 And may you have the power to understand, as all God’s people should, how wide, how long, how high, and how deep his love is. 19 May you experience the love of Christ, though it is too great to understand fully. Then you will be made complete with all the fullness of life and power that comes from God. The powerful prayer culminates with a benediction expressing the extent of God’s ability to accomplish His will by means of the power He has placed in those who believe according to working of His mighty power. God is able to do far above all we ask or think. Life’s greatest challenges will not prevail, but they will shrink. Although threatened on every hand, we refuse to back down. In the midst of what seems to be defeat, we will still rebound. If we have to, we will walk on water and will not sink. Of total defeat, so the enemy would have us to think. That His Word nourishes and sustains us more than food or drink. As we rise untouched, not singed, even from a fiery showdown. If it be so, our God whom we serve is able to deliver us from the burning fiery furnace, and he will deliver us out of your hand, O king. from the burning fiery furnace, and he will deliver us out of your hand, O king. 25 To the only wise God our Savior, be glory and majesty, dominion and power, both now and ever. Amen. 20 Now to Him who is able to [carry out His purpose and] do superabundantly more than all that we dare ask or think [infinitely beyond our greatest prayers, hopes, or dreams], according to His power that is at work within us, 21 to Him be the glory in the church and in Christ Jesus throughout all generations forever and ever. Amen. out of your hand, O king. 25To the only wise God our Saviour, be glory and majesty, dominion and power, now and ever. Amen. If we are thrown into the blazing furnace, the God whom we serve is able to save us. He will rescue us from your power, Your Majesty. 19 Then the king arose at dawn, at the break of day, and hurried to the den of lions. 20 When he had come near the den, he called out to Daniel with a troubled voice. The king said to Daniel, “O Daniel, servant of the living God, has your God, whom you constantly serve, been able to rescue you from the lions?” 21 Then Daniel spoke to the king, “O king, live forever! 22 My God has sent His angel and has shut the mouths of the lions so that they have not hurt me, because I was found innocent before Him; and also before you, O king, I have committed no crime.” 23 Then the king was greatly pleased and ordered that Daniel be taken out of the den. So Daniel was taken out of the den, and no injury whatever was found on him, because he believed in and relied on and trusted in his God. To the only wise God our Savior, be glory and majesty, dominion and power, now and ever. Amen. The bulk of the massive then newly sighted ring in 2009 starts about 3.7 million miles (6 million km) away from the planet and extends outward another 7.4 million miles (12 million km). The ring’s orbit is tilted 27 degrees from the planet’s main ring plane. With Saturn’s diameter being nine times greater than Earth’s, the diameter of the supersized ring is equivalent to lining up 300 Saturns side by side. Most amazingly its entire volume can hold one billion Earths. Reading about these discoveries in outer space and other current events caused me to see and appreciate the magnitude of the creative power of God in a new way. This information is staggering in light of the demonstrated power of God manifested through the Spoken word of God recorded in Genesis where “In the beginning God created the heavens and the earth.” Later the account indicates, “And God made two great lights; the greater light to rule the day, and the lesser light to rule the night. . .” Then almost as a modest aside, we learn “He made the stars also.” All the starry hosts with its millions upon millions of stars God made, each of which He numbered and called by name. And God is able to do exceeding abundantly above all that we ask or think according to the power that works in us.